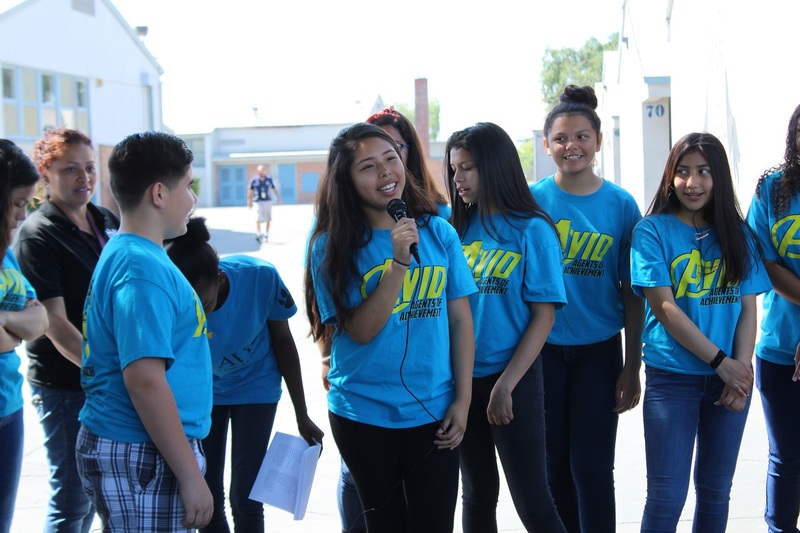 Los Alisos Middle School’s Advancement Via Individual Determination (AVID) students rapped motivational verses to celebrate the opening of their college and career center. Los Alisos is the sixth and final Norwalk-La Mirada Unified middle school to offer a college and career center to students, allowing all middle school students throughout the District to plan early for higher-education options and a profession that suits their skills and passion. It follows the opening of centers at Hutchinson and Corvallis middle schools in 2015-16, Benton Middle School in August 2016, Waite Middle School in September 2016 and Los Coyotes in December 2016. Los Alisos’ college and career center is open to students during lunchtime and recess. Students are able to research and obtain information on potential colleges and careers, as well as speak with an on-site counselor. Superintendent Dr. Hasmik Danielian launched an initiative to open centers at every middle school campus after a Corvallis Associated Student Body member advocated for one at her school. 061517_NLMUSD_LOSALISOS1: Los Alisos Middle community members and administrators gathered to celebrate the opening of the school’s college and career center. This is the sixth and final middle school college and career center to open at Norwalk-La Mirada Unified. 061517_NLMUSD_LOSALISOS2: Los Alisos Middle eighth-grader Daisy Esquivel (center) and her AVID team raps motivational verses on preparing for their futures in celebration of the school’s college and career center opening. Los Alisos Middle eighth-grader Daisy Esquivel (center) and her AVID team raps motivational verses on preparing for their futures in celebration of the school’s college and career center opening. Los Alisos Middle community members and administrators gathered to celebrate the opening of the school’s college and career center. This is the sixth and final middle school college and career center to open at Norwalk-La Mirada Unified.